As always….thank you for a concise answer to an issue we struggle as coaches with teachers we work with. Patty!!!! It is disheartening to see these levels publicly posted in classroom data walls and children’s understanding of what it means to be literate down to an letter. No one can say it better than Dr. Fountas! All of the administrators and teachers in our district have received this! Thank you! Thank you! I wish we would evaluate children on the progress they have made as an individual—not the teacher-generated level they are expected to be reading at a specific point in the school year! Thank you for this! I wish I could share it with my own daughter’s school and administration! Telling the students their level is serving to be a major downfall in the confidence of my daughter, let alone others as well. the take-away for me from this blog entry is the importance of readers/writers working with a variety of text forms across various levels. i think it’s unrealistic to keep learners and their families in the dark about levels. even the youngest readers come to see the levels printed on texts. rather than ignoring this and telling parents and children that “levels don’t matter”, we need to deepen their understanding of the benefits in reading challenging, easy and just-right books in the different ways that make reading for meaning possible. a young student once picked up a book from a desk that was far beyond her instructional level, saying that she wanted to read the story but knew it was too hard. i simply reminded her that she could indeed read that book through a read-aloud. she did end up taking the book home and asking an older sister to read it to her. when she returned to school the next day she was so excited to tell me about the story and told me that she’d be able to read that book on her very own one day. we are working on helping parents understand the gradient of text difficulty. we are beginning to do this by carefully sharing of pieces of the continuum, in parent-friendly ways. this way they can see what their child is capable of doing and the next steps we will work together through to support their child in becoming a proficient reader who is confident and engaged, and who just can’t wait to jump into a new book! We have been discussing this topic in depth this year and trying as a grade-level team to determine the best way to show kids where to do their book shopping. In the past, large bookmarks were used that indicated, month-by-month, the level where each child was reading independently. I have opted not to go this route this year as I saw the pressure it put on children not to mention the competition it brewed. But I still need to direct kiddos to bins within our leveled library. Do you//others have suggestions on doing this successfully? Thank you in advance! You are very thoughtful about the importance of children accessing books that they can enjoy. 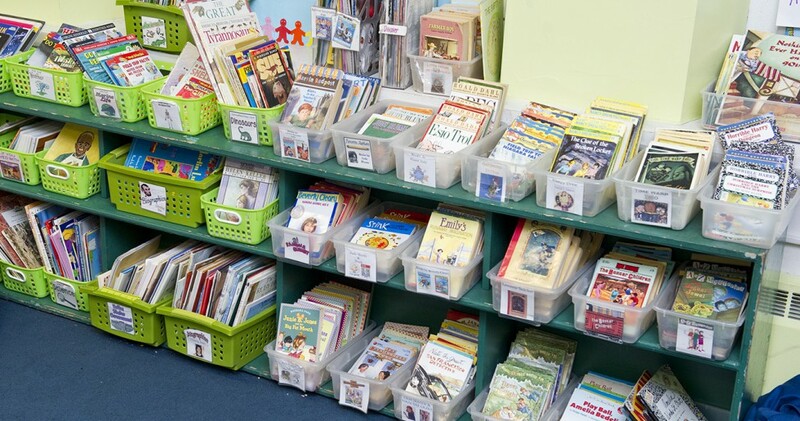 Consider creating a browsing basket for the guided reading group and put in it some books for them to reread as well as some varied levels of books below their instructional level. Tell them you created a blue basket that has many books they will enjoy. Teach minilessons on how to choose books that they can enjoy and understand. We scripted some of those in Guiding Readers and Writers as examples. The focus is on having the students try a page and see if they can read it smoothly and understand. Also be sure all the baskets you create have a range of levels for children to choose. You may want to book talk easier and harder books to bless the easier ones for kids who need them. I have missed seeing you at Heinmann events, but I am about to teach a class to a group of K-1 teachers and this is a perfect compliment to the content about selecting books for small group guided reading as well as the way we can become too reliant on a number and forget that we teach kids – and the kids teach us. On another note, we are starting our study of the Continuum K-8 alongside our use of the Comprehensive Language and Literacy Guide. Finally, we continue to enjoy LLI and are seeing the exceptional results. I hope we can add more to our work and have recommended this for our middle schools as the kits become available. I SO enjoyed our time in Boston as we worked through some of the ideas related to moving LLI into middle grades. Thank you for all your work and guidance throughout the years. I’m teaching the same thing! I’d recognize you anywhere! Will be in Columbus in Feb. with “The Queen”. You found me!!! yea! I hope to see you soon – it’s been far too long! Amazing how the thread of important teaching remains constant while we add to it with new refinement and learning. Terrific post. It reminds of another quote, I believe by Fountas and/or Pinnell: “Levels are for books, not for students.” I plan on sharing this post with my staff. It is wonderful to hear again the common sense and smart instructional underpinnings of the guided reading levels. It spurred me to post a reflective blog of my own today http://bookmansbytes.blogspot.com/ ….and to want thank Irene and Gay Sue for their tireless advocacy for readers and the teachers and librarians who strive to put the right book in the right readers hands. For a district that does list the F&P level on the report card at the end of the year, how can we do so responsibly, when the goal is to communicate with parents about the characteristics of text that their children have mastered, in relation to grade level expectations? Wonderful post! Reminded me of hearing Australian author Brenda Parkes speak at IRA one year..she said (in a most loving way) …”you Americans have a tendency to take everything to the extreme” You bet we do! I’m a teacher and my daughter is in 2nd grade and any time I recommend a book to her she asks if it is on her level and it makes me crazy!! I want her to read because she is interested in the book!! We as educators do need to be careful about how we are “leveling” the students and informing them what it means! We agree that it is important for children to make their choices for books without levels. What if they continue to make poor choices of books that are to high or low. With levels they have a range to choose books right for them. It is important to teach students how to make good choices. They will need to do that as a life skill. You can provide minilessons or conferences that show the student how to judge. How do low level readers know how to choose a just right book? I have watched them pretend read and flip through pages and act as if they are reading. Young struggling readers need levels to know what to read and at their level to improve their independent reading skills. You have always suggested that the children look at genres and not levels. What is your suggestion for the struggling readers and reluctant readers that are expected to read and choose books independently without being able to tell if it’s at their level? I suggest walking the child through the important things to think about in making a choice so they learn how to make good choices. Teach them to try a few pages and make a decision. Thank you for your response. The problem I see with young readers in the LC model we currently use is when teachers are doing their guided reading lesson, only a handful of children are engaged in reading while the others are paging through and changing different books 3-4 times in the 45-60 minute reading block. There is no accountability with these independent readers to know if they have actually read the book. AR is being phased out of our curriculum. What do you suggest to keep 25 readers engaged and accountable for reading when they are not doing their guided reading or conferencing? In my opinion, for the most part, teachers are not the issue or problem at hand. As you know, the messages, guidance and rules come from above. I firmly believe that the majority of teachers appreciate and are using your levels in a manner that benefit our students and as a tool to inform parents about their child’s reading abilities. Thank you for your never ending desire to embrace and courage our little readers! Love this post!! Thank you for all your valuable insight into reading!! Working in a school where kids have to memorize their Lexile number it’s refreshing to hear this information straight from experts! I am taking this post into my principal Monday morning. If teachers spend more helping kids find books based on their genre and authors the have enjoyed in the past, they are much more likely to become avid & strong readers for the rests of their lives! Is that what teaching reading is all about? Thanks again! I love how you addressed the misconceptions occurring from using reading levels. Students are not a reading level, and should not identify as such. I do believe that teachers can use what they know about levels to understand the reading behaviors of their students in order to purposefully plan for instruction. As an instructional coach, I use the continuum to help guide teachers to use levels appropriately. I also use your article about the romance and reality of guided reading. Thank you for this blog and all you do to support teachers! This our first year with guided reading. I found this information very helpful as I navigate through year one. Thank you and keep reminding us! Newbie teachers, who adhere to leveling as a structured comfort, often lack the experience to allow students to read what they choose. Often, it is the accelerated child, rather than the struggler, who is told to put the brakes on. I know teachers who have a variety of systems but I label my classroom books with the corresponding color dots and put them together in baskets in my classroom library. The A/B books are red dots, C/D are orange and etc. I know what F&P letters they correspond to but my students don’t. The leveling system is so helpful for teachers who are just starting out and anyone really teaching students. Thank you!